Students obtaining a master’s Degree in Physics must satisfy both general University requirements and departmental requirements. The Physics Department awards either a “General Master’s Degree” or an “Applied Master’s Degree” depending on course of study. (See the Director of Graduate Studies for the department requirements for the Applied Master’s Degree). Taking specific physics graduate courses — waivers of departmental requirements may be obtained by applying to the Director of Graduate Studies. Those candidates who can demonstrate competence in a foreign language equivalent to that attained at the end of two years of college study may receive a M.A. degree, if they wish. All others receive a M.S. degree. Prior training equivalent to a bachelor’s degree in physics. A total of 45 graduate credits of which at least 30 credits are earned Oregon courses. The grade point average for all graduate work at the University must be 3.0 or better. At least 32 credits must be in physics, including at least one full-year sequence at the 600 core course level. The 32 credits in physics must be graded. The remaining credits may be earned in related fields, such as mathematics, chemistry, biology, geology or other courses approved by the Director of Graduate Studies. At least 3 term-length courses in mathematics are required. This requirement may be met totally or in part by previous courses taken in a mathematics department. Courses selected from the following list will satisfy the requirement provided that they include a two or three term sequence. Other courses may also satisfy the requirement, but they must be approved by the Director of Graduate Studies prior to registration. The general department requirements are required of all General Master’s candidates. The Master’s requirements can be completed by either passing the Master’s final exam, submitting a written thesis, or taking specific courses. These options are described below. Inform the Director of Graduate Studies, who will appoint an advisory committee consisting of three physics faculty members including the advisor as chairman. The candidate will meet with the committee, which will judge the proposed scope and content of the thesis. Both of these should be reasonably well-defined at the outset. The thesis should be worthy of at least 9 graduate credits and should require some original contribution by the student. Submission of the thesis to the committee members (step 5) may occur no earlier than three months after this committee meeting. 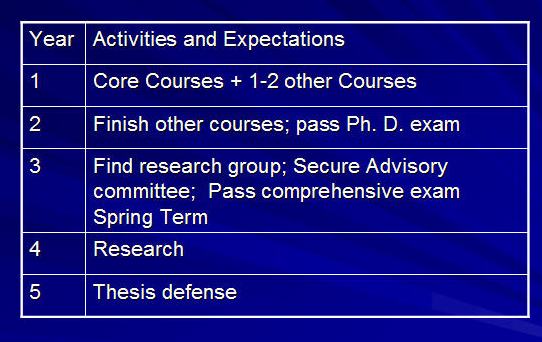 Complete 9 credits of Thesis (PHYS 503) or 6 credits of Thesis and 3 credits of Research (PHYS 601). Submit the Master’s Thesis to the committee members. If the committee agrees that the thesis does not require major revisions in its scope or content, it will schedule an oral defense. Present a short oral defense of the thesis to the committee. Submit the thesis in a form acceptable to the Graduate School. Students must complete the Master’s thesis within three years of the date of admission to the graduate program. Students may also choose the specific physics course option. The courses that are used to satisfy the general requirement may also be used to satisfy this requirement. Other laboratory courses may be approved by the Director of Graduate Studies. The approval for these laboratory courses must be made prior to the time of registration. These laboratory courses also must be taken as graded courses. If the student chooses the specific physics course option then all courses for the Master’s degree must be completed within a three year period starting from the time the student enters the physics graduate program. The student must complete three years full-time work beyond the bachelor’s degree with at least one academic year (three consecutive terms of full-time study, with a minimum of 9 completed graduate credits per term) in residence on the Eugene campus after the student is oficially enrolled in Ph.D. program. The grade point average for all graduate work at the University must be 3.0 or better. The student must complete the department’s core graduate courses: PHYS 611,612 Mechanics, PHYS 613,614 Statistical Physics, PHYS 622, 623 Electromagnetic Theory, PHYS 631, 632, 633 Quantum Mechanics and PHYS 610 Mathematical Methods. Students who can demonstrate adequate competence in one or more of these subjects based on previous study in graduate-level courses can be excused by the Director of Graduate Studies from completing the corresponding required courses here. (Students who entered graduate study in the academic year 2006/7 or earlier are excused from taking these required courses). The student must pass the unified graduate exam at the master’s level by Spring of the second year of graduate studies, or be terminated from the program. The student must pass the unified graduate exam at the Ph.D. level by the end of the Fall Quarter of their third year in the program, or be terminated from the program. This requirement basically gives students 5 chances to pass the Ph.D component of the unified exam. Last Resort: Students that have not passed the Ph.D component by the deadline, have until 10 days after they have received their exam results to petition the Graduate Studies Committee for an oral examination to replace the written component of the Ph.D portion of the unified exam. The Graduate Studies Committee shall review the case of the student and, if the student has, in the view of the committee, been making satisfactory progress in coursework and research, shall appoint an ad hoc committee of three professors to administer an oral exam to the student by the end of the fall academic term. At least one member of the examination team should be on the Graduate Studies Committee. The student’s research advisor, if any, shall not be appointed to the examination committee. The oral exam shall cover any areas that appear weak in the prior written exams, other areas of physics covered in the written exams, and areas of physics that are especially relevant to the student’s research interests. The ad hoc committee shall report the results and its recommendations to the Graduate Studies Committee. Based on the results of this oral exam and the totality of the student’s record, the Graduate Studies Committee may rule, after a meeting open to the faculty, that the student has passed now meet the requirements for passing the Ph.D component of the unified exam and can continue on. The student is to round out his/her knowledge of physics by taking at least six additional graduate courses beyond the physics core courses. Normally these courses will be additional courses in physics but they may include other graduate science or mathematics courses as approved by the Director of Graduate Studies. The normal expectation is that all students will have completed this requirement by the end of their second year in residence. Whenever a student takes a reading course it will be listed as “PHYS 605”. However, the subject of that course does not appear on transcripts or elsewhere (and many different subjects are taken under the umbrella of PHYS 605). Therefore, whenever such a course is taught, it is the obligation of every student taking that course to inform the Department by sending an email to both Jodi Myers (myers2@uoregon.edu) and Steve Gregory (sgregory@uoregon.edu) listing the subject of the course, the term during which it is being taken, the name of the instructor and the name of the student. The comprehensive examination will be administered by the Comprehensive Exam Committee (see below). The purpose of the comprehensive exam is for the student to exhibit sufficient background knowledge in the area of their thesis research in order to demonstrate the feasibility of their thesis subject. It is not expected that the student will have complete mastery of their thesis subject. Before the Comprehensive Examination, the student will prepare, at the request of the Committee Chair, a written presentation of a current problem in physics and a proposal for a research project related to that problem. At the Comprehensive Examination the student will be expected to present this material orally. The committee will question the student on the subject of the presentation and related physics issues. The examination will be closed to the public. The student is expected to understand the background and fundamental physics of the problem area and to communicate this knowledge to physicists in other fields. The student will be judged on his or her understanding of the problem, ingenuity, and ability to apply his or her knowledge in the proposed research area. If minor deficiencies emerge as a result of the oral examination, the committee may require additional work, oral examination, or written presentations. Deficiencies must be rectified within a six month period for a successful pass of the Comprehensive examination. Timing: Normally, students are expected to pass the Comprehensive Examination by the end of spring term of the third year in residence in the program. This means that students should secure a Thesis Advisor as soon as possible after completion of the Ph.D exam. In order to expedite advancement to candidacy, the Department does not require full completion of the breadth requirements at the time of the Comprehensive Exam. Realizing that some breadth courses are not taught every year and that students may need to wait to take these, the requirement for the Comprehensive Exam is that they have taken 3 or more of their breadth courses at the time of the exam. In any event, the Comprehensive Examination must be passed before the end of fall term of the fourth year unless the Director of Graduate Studies waives this timing based on special circumstances. At least one week prior to the date of the Comprehensive Examination the student will communicate by email to both Jodi Myers (myers2@uoregon.edu) and Steve Gregory (sgregory@uoregon.edu) the date and time of the examination and the list of members of the committee. The Physics Department believes that every student should be capable of giving a lucid talk about physics. Accordingly, sometime during his or her research work (and certainly before submitting a Ph.D. dissertation) the student must give at least one talk either in a local research seminar or at a national conference. If this is a local (i.e. on Campus) presentation then it must be advertised or posted in advance and the audience must include faculty. The talk may cover an item of interest in the research literature or the student’s own work. The student must write a dissertation. It must embody the results of research and show evidence of originality and ability to perform independent investigation. The student must take at least 18 credits of Dissertation (PHYS 603) after advancement to candidacy in order to graduate. The student must pass the Final Examination, which is the defense of the dissertation. For important regulations concerning the time of notices, final approval of the thesis, etc., consult the University Bulletin and the Graduate School. Reducing the number of courses that is necessary to take for graduation. Tightening up the procedure for students to secure a committee and complete the Comprehensive exam sooner. (See the committee section below). The graphic below presents a visual summary of the optimal timeline to a Ph.D. While years 1 and 2 are common to most graduate students, year 3 is the cause of variance, with some students taking up to 3 additional years to accomplish the listed goals. We encourage all grad students to be more proactive in completing these Year 3 objectives in as timely a manner as possible. In fact we strongly advise students to make a connection with a research group at the earliest opportunity. Within one year of passing the Ph.D component of the unified exam, the student must obtain a dissertation research advisor and a Departmental Advisory Committee. Immediately upon passing the examination (or earlier, if possible) the student should identify a prospective advisor and by mutual agreement register for research, PHYS 601, with that advisor. Within 6 months it should be determined whether the apprenticeship should continue. If the initial pairing is unsuccessful, the student must arrange for another prospective advisor and repeat the trial process. After an advisor has been secured and the trial period has been completed, the advisor will notify the Director of Graduate Studies, who will then appoint a Departmental Advisory Committee for the student. This committee will promptly meet with the student to plan future studies. Thereafter, the committee will meet at least annually with the student to review progress towards the degree. These meetings will normally include an oral report and a short written progress report by the student. The written report shall be delivered to the committee at least one week prior to the committee meeting. (In the event that the student is doing research outside of the state, the committee may, at its discretion, modify these procedures appropriately). The chair of the Departmental Advisory Committee will report to the Director of Graduate studies that these progress reviews have taken place, and, based on those reviews, project the date of Ph.D completion. The Director of Graduate Studies should be notified immediately of any serious problems. This committee will normally consist of the advisor and two additional faculty members fron the Physics Department, one of which should be in a research areas related to the student’s projected research. The chair of the committee, who shall have the responsibility to call and chair meetings of the committee and report to the Director of Graduate Studies, shall normally be someone other than the research advisor. Finally this committee will transition to become the Exam committee by adding one more faculty who is outside the department of physics. Any examination must be scheduled when all committee members can attend. Under special circumstances the Director of Graduate Studies may authorize the examination to proceed with as few as three committee members present. However, these committee members must include the committee chair and the advisor. (Note that, although in exceptional circumstances the Director of Graduate Studies may authorize the Comprehensive Examination to take place without the committee member from outside the Department of Physics, the rules of the Graduate School require that the outside member be present at the thesis defense). After passing the Comprehensive Examination, the student is advanced to candidacy by the Graduate School, which then appoints the candidate’s Dissertation Committee. This committee will normally be the Committee that administered the Comprehensive Examination. The candidate cannot graduate any sooner then six months after the appointment of the Dissertation committee, or later than seven years after passing the unified graduate exam at the Ph.D. level. The chair, who must not be the primary thesis advisor, but must be member of the Department of Physics. The chair should preferably be in a field the same as or related to that of the student and advisor. A member of the Department of Physics from a field not related to that of the student and advisor. A member of a department other than the Department of Physics. A member of the Department of Physics in a field the same as or related to that of the student and advisor. If possible, this member should be a theorist for an experimental student or an experimentalist for a theory student, but this is not essential.